Tag Archive | "civil unions"
The Hawai‘i State Department of Health (DOH) today announced new information about the state’s upcoming civil union on-line application process scheduled to be activated on January 1, 2012 at 12:00 a.m. 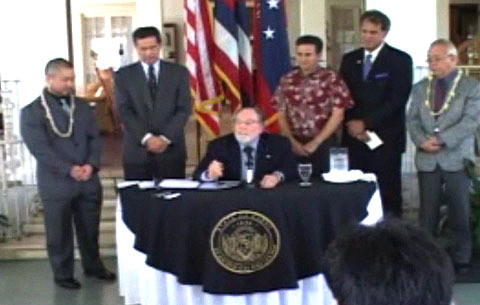 Governor Neil Abercrombie today signed into law the civil union bill making Hawai’i the seventh state in the nation to recognize civil unions. The bill signing ceremony took place this afternoon at Washington Place among key lawmakers and about 100 invited guests who helped move passage of the measure through the legislature.